The first class in 1988 was made up of students from the United Nations (3), Embassies (6) and the Private Sector (2). As the School grew, admissions policy was established by the Board to ensure that families prioritised in the Memorandum of Understanding and the Constitution could secure places (see the Valuable Partnership section for more detail) and the School has remained committed to being the most inclusive School it can be with a nationality policy adopted to ensure we remain truly international, and a Scholarship Programme to help with socio-economic diversity. For the start of the 2016-2017 school year a record 1,123 students enrolled at UNIS Hanoi. The School has grown both in numbers and in its campus size, and although the proportions have shifted with the changing terrain of the Vietnamese economy, UNIS Hanoi still serves families from UN agencies, diplomatic missions and the private sector. The demographic shifts of our learning community reflect the steady economic growth of Viet Nam in recent years, with one of the fastest per capita GDP growths in the world (averaging 6.4 percent per year in the 2000s) and with Foreign Direct Investment up year on year for the last five, topping $4BN USD in the first quarter of 2016. 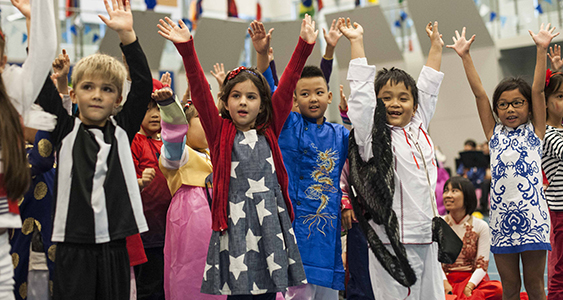 Increasingly our identity as a United Nations International School is not defined by the community we serve, but through our ambitions as educators to shape the next generations and contribute to creating a better world. Our commitment to bring the world together on one campus to deliver our Mission and strive for our Vision has grown stronger over the decades. And today, with a diversity policy in place to ensure international representation, UNIS Hanoi is proud to welcome students from more than 65 UN member states and help shape those futures. In addition UNIS Hanoi is proud to continue to provide an international education for Vietnamese families in a country facing so much fast change and to build capacity for the country’s future. It was this investment in our host country’s future that also inspired the UNIS Hanoi Board to establish a scholarship programme, enabling some of the country's most talented students from disadvantaged backgrounds have access to a UNIS Hanoi education.